Despite the ongoing debt crisis, European banks continue to dominate the ranks of the World’s Safest Banks in 2011, just as they did a year ago. More than half of the banks listed by Global Finance as the world’s safest are based in Europe, and the highest ten positions are filled exclusively by European banks. Taken as a whole, this year’s Safest Bank list looks remarkably similar to last year’s. The top nine banks on this year’s list have not changed from last year. They continue to show the underlying strength to maintain top ratings—a strength that has allowed them to weather the storms of the past few years intact, and perhaps all the stronger for it. The only significant casualty has been Spain’s Caja de Ahorros y Pensiones de Barcelona (La Caixa) which failed to make this year’s list after being ranked 28th last year. The bank held double A ratings from all three of the major credit rating agencies last year, but these dropped to single A ratings this year, primarily as a result of its high concentration in the Spanish market and the rating agencies’ poor outlook for Spain’s banking sector. New Zealand’s ASB Bank and French firm Crédit Industriel et Commercial (CIC)—17th and 45th in the 2010 listing—were excluded this year due to a change in methodology: 100% wholly-owned institutions are excluded when they are part of larger banking groups which are already featured in the list of Safest Banks. ASB is owned by Commonwealth Bank of Australia (12th on this year’s list) and CIC is part of France’s Crédit Mutuel Group (ranked 39th this year). The safest banks chart compares the ratings for the world’s largest 500 banks, based on asset size. Long-term foreign currency ratings issued by Fitch Ratings, Standard & Poors and Moody’s were used. Where possible, ratings on holding companies were used rather than operating companies and banks which are wholly-owned by other banks were omitted. Government import-export finance institutions were also omitted. Within each rank set, banks are rated according to asset size based on data for the most recent annual reporting period provided by Fitch Ratings and Moody’s. A tie is assigned when two banks with the same score have total assets within a $5 billion range. Ratings are reproduced with permission from the three rating agencies, with all rights reserved. A rating is not a recommendation to purchase, sell or hold a security and it does not comment on market price or suitability for a particular investor. Many of the high-scoring European banks are government owned or connected to municipal authorities. All of the top five banks enjoy some form of privileged relationship with national or regional bodies in their own countries. All hold triple-A ratings from Fitch, Standard & Poor’s (S&P;) and Moody’s. Italy’s Cassa Depositi e Prestiti, in 31st place, also benefits from state support. Banco Santander, BNP Paribas, Deutsche Bank, Barclays and Intesa Sanpaolo, all of them privately-owned universal banks, also feature in the list in 2011. "Rabobank draws its strength from local communities where [our] cooperatives are based"
Perhaps equally as remarkable as the dominance of European banks is the number of Canadian and Australian which are included in the top 50: six Canadian banks and four from Australia made the list. 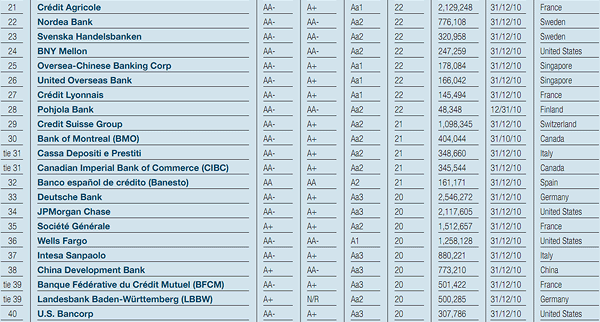 Bank of New York Mellon is again the highest-ranked US bank, and this year rises to 24th place from 30th in 2010. Singapore’s DBS Bank, in 19th place, leads the Asian contingent, followed by Oversea-Chinese Banking Corporation and United Overseas Bank, also from Singapore. The 2011 ranking features two Chinese banks: China Development Bank (38th) and Agricultural Development Bank of China (42nd). Shizuoka, in 43rd place, is the highest ranked Japanese bank, as it was last year. National Bank of Kuwait (NBK) and National Bank of Abu Dhabi (NBAD) are again the only two Middle Eastern banks to be included in the Safest Banks list. Following Moody’s downgrade of NBK to Aa3 from Aa2 in June this year, both banks enjoy the same ratings from each of the three agencies. As a result, NBAD nudges ahead as a result of its larger asset size. To be eligible for inclusion in Global Finance’s World’s Safest Banks listing, banks must be among the largest 500 in the world by assets and must hold ratings from at least two of the three big rating agencies: Moody’s, S&P; and Fitch. 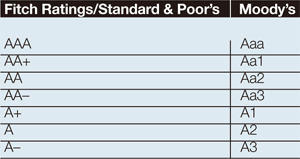 Eligible banks are then awarded points corresponding to the level of each of the ratings they hold. If a bank has only two ratings, then an implicit score for the third rating is calculated by taking the average of the two actual ratings, and deducting one point. If several banks have the same total score, then they are ranked by asset size, although banks whose asset sizes are within $5 billion of each other are awarded a tie. All except one bank in this year’s list hold two double-A ratings. Bank of Tokyo Mitsubishi, which crept onto the list in 50th place, has one double-A rating and two single As. Many well-known banks fell short of the number of points needed for inclusion. Goldman Sachs and Citigroup hold single A ratings from all three agencies, and Lloyds Bank’s AA- from Fitch is not enough to compensate for the single As it holds from Moody’s and S&P. ; None of Spain’s savings banks—some of which previously featured in the ranking—have ratings high enough to make the list. Global Finance also, separately, ranks the safest banks by region. None of the seven banks in the regional ranking for Latin America, nor the ten banks for Central and Eastern Europe (CEE), make it into the list of the Top 50, but all have investment grade ratings from at least two of the major rating agencies. Všeobecná úverová banka from the Slovak Republic is the top ranked CEE bank, with an A+ from Fitch and an A1 from Moody’s. Banco del Estado de Chile, leads the Latin Americans with an A+ from S&P; and an Aa3 from Moody’s. Global Finance’s annual listing of the safest banks by region.